Editor's Note: In 2011, David Zwang began a series that looked at the current production inkjet product offerings from a wide range of vendors, discussing how they are being, or could be, used. He also looked at some of the new inkjet technologies that were just starting to be seen in product introductions and technology demonstrations during drupa 2012. Now that time has passed and many of the production inkjet vendors are beginning to introduce new offerings, David will continue to look at many of these new products as they are introduced in the context of what was learned in the original series. As expected the next generation of production inkjet press releases are coming fast and furiously. Recently I covered the new Canon ImageStream 3500, and the Kodak Prosper 6000, and now we will look at the new Ricoh Pro VC60000. As you recall, I wrote about the predecessor platform of this new press, the InfoPrint 5000,in my pre-Drupa production inkjet series. This previous platform was originally marketed by the IBM Printing Systems Division prior to its staged acquisition by Ricoh starting in 2007 and will continue to be marketed by Ricoh for the foreseeable future. The InfoPrint platform was one of the earlier entrants into the production inkjet space, and has been very successful for IBM, Ricoh and Screen, who was the manufacturer and a partner in the machine’s development. Between the two companies, there are currently over 700 of these units installed worldwide. Screen markets it as the Truepress Jet520, but essentially the two presses are cut from the same cloth. Even with the many enhancements Screen and Ricoh each incorporated over time, the platform was ready for a refresh. It’s not just that other production inkjet press manufacturers were entering the market, it’s that the underlying technology, in print heads, ink, and media, have moved production inkjet capabilities to new levels and users are interested in using the technology for higher coverage applications beyond the transactional applications for which it was originally designed. New developments across the vendor base have now extended the reach of production inkjet into higher quality applications, furthering the migration of volume from toner and liquid ink to inkjet, but from offset to inkjet as well. While the InfoPrint platform, with its three different models, is strong in Transaction and Book applications, this new platform which has been in development for over 6 years, is designed to address Commercial Print, full color Books, Marketing Collateral and Direct Mail. While Ricoh expects this to coexist with the 5000 series for a while, make no mistake, the new Pro VC60000 is truly next generation, and has more of the Ricoh DNA than the InfoPrint 5000. As one of the largest print equipment manufacturers in the world, Ricoh has significant resources that the company has been able to take advantage of with the development of this new platform. It should also be noted that Ricoh has continued their successful partnership with Screen in the development of this new line of inkjet presses. The new Screen version is the Truepress Jet 520HD, and I will be covering this press as well as some of the other new Screen introductions in a later article. The older InfoPrint platform used Seiko Epson inkjet heads and inks; however, this new platform uses Ricoh’s own print head technology. Many may not realize that Ricoh has been an inkjet print head manufacturer for about 30 years, with more than 20 years of developing and manufacturing piezo heads. However, most of those heads have found their way into other manufacturers’ products in industrial and specialty printing applications, including wide format, textiles, 3D modeling and laminate printing applications. The implementation of the Ricoh print heads on the Pro VC60000 is very interesting. While all production inkjet manufacturers have had to balance resolution and speed with cost, Ricoh has approached this implementation in a fairly unique way. The aqueous-based pigment heads are rated at native 1200 dpi, which is more than sufficient to address the quality needs of commercial print applications. However, the way they achieve this is by creating a print head module comprised of an matched array of 600 dpi heads, placed in scanning direction to make print head adjustment and sheet inspection easy. This new implementation achieves the currently rated 50 meters/minute at 1200 x 1200 dpi resolution on the Pro VC60000, while maintaining the ability to increase the speed in the future and keep costs down. It has the requisite print head cleaning and capping system to ensure quick startup and imaging consistency. The press can also be operated at 70m/m at 1200 x 600dpi, or 120m/m at 600/600 dpi. Additionally, now that Ricoh is no longer compelled to use Epson inks, the cost of ink should be more competitive as well. While the Pro VC60000, like most of the new generation of production inkjet presses, can run a wide variety of conventional offset and inkjet treated papers, Ricoh has chosen to include an Under-Coat unit that currently supports a flood coat on 1 or 2 sides of the media. Additionally, there is an optional Protector-Coat unit, which can be activated on the available 5th cartridge station to improve ‘smear resistance.’ It is currently applied to the whole page at a lower coverage, but I believe that it may allow spot coating and perhaps gloss at some point in the future. This combination of pre- and post-print units allows the press to support wide range of media from uncoated to offset glossy, at paper weights from 40-250 gsm at widths of 165-520 mm. Ricoh’s ink cartridge system consists of two10-liter disposable containers per color and sits independently from the engine. 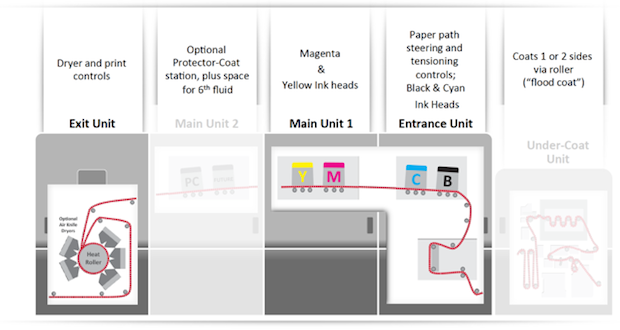 Inks can be changed on the fly, without stopping the press, and the machine automatically switches to the new cartridge when the other one is empty. The Pro VC60000 has a new, user friendly, browser based interface to control the press. which can even be accessed remotely. In addition to all of the press control and status information, it also includes an enhanced job preview that shows the RIP’d file and its individual color separations. It supports new color management functions that can address differences in media side and file object type as well as spot color dictionaries. It also has imposition capabilities, including saddle stitch, cut & stack, and trim marks. The VC60000 is already in beta testing in Japan, Europe and the US, and commercial availability starts early in 2015. Depending on the configuration, the machines cost is in the range of $2-3 million, and Ricoh expects the total cost of ownership (TOC) to be very competitive. While this is the first of the new Ricoh-designed production inkjet machines, I would expect to see more models from the company in the future that will take advantage of the many technologies it has at its disposal. RE: "The aqueous-based pigment heads are rated at native 1200 dpi"
Although it's common usage, unfortunately, dpi does not define "resolution." Instead it defines "addressability." Dpi tells you how many locations a splat of ink can be deposited but not the actual size of the splat of ink. So, the actual size of the mark the droplet of ink makes on the paper of a 1200 dpi device is unknown. It might be more helpful to include some photomicrographs of, for example, some small text printed by the different devices, to compare their ability to render the same original graphic. Gordon..of course, technically you are correct. However trying to compare various devices on a playing field, in the context of an industry's frame of reference lends itself to this measurement. However, there are many other ways tha this can be done as well. I would defer to Henry Freedman, who has spent years researching, and identifying many of those methods..
David, if the measurement itself is meaningless then the comparisons are meaningless irrespective of the industry's use of it as a frame of reference. The industry misapplies "dpi" because it makes for an impressive specification without it actually meaning anything in practical application. Why perpetuate the misuse of terminology? That is why I suggested including some photomicrographs which would, if nothing else, provide a visual guide as to the imaging quality from a "resolution" point of view. when we discuss printing it is best to define resolution as what is delivered on the substrate which people see. Best use is how many line pairs (black line and a white line next to it followed by another black line) per millimeter showing what the recording/printing system and substrate can deliver and these are inseparable. Manufactures just like to use what Gordon is correct in saying "addressability" but that is not on printed product. One could actually get a lower resolution from a higher addressable system due to on press and drying issues. Toner press manufacturers are notorious for this. the connection between the digital front end and the press. and to define resolution on the printed sheet. Some printing systems deliver what they say and we call these "honest" systems, if the don't deliver the resolution and "DPI" on press we call these "dishonest" systems. Several things happen when an inkjet droplet hits a substrate, a. deformation from impact,(ink jet is actually a form of "impact printing" believe it or not since the droplet hits the substrate) 2. Absorption or drying spread and gain, as ell interaction of overprinting of dots etc. how this can be measured. The best way to tell is to print the resometer on the press and match it to vendor claims and how press is set to run as well as substrate and ink behavior. To be honest in ink jet a trust but verify process has shown that maybe a little less trust is proper. Hi Henry - Thanks for responding (we have had discussions about your resometer in the past). I don't expect David to do a technical analysis (e.g. the resometer) of the digital printers he discusses. What I hope for is clarity and correctness in the use of terms so that his reports are not just parroting (misleading) vendor claims. You're correct about using line pairs to determine resolution and would form part of a test suite to help determine a vendor's claims. However, in this instance, my feeling is that the prospective customer for these types of devices would be happy, when the issue of resolution arises, to see a photomicrograph of a representative graphic (i.e. one that shows how well the device resolves the graphic) to get an idea as to how well the device renders detail. Something like this: http://tinyurl.com/oe4mryu (this actually shows different printing methods but gives an idea of what I'm referring to. Microscopes to take these kinds of pics are quite inexpensive (less than $50) and are easy to obtain. Beyond just clearly showing how accurately the printer resolves a graphic the photomicrograph may reveal artifacts such as satellite droplets. A simple thing to include that would provide more clarity to vendor claims in reports such as David's. Ok Gordon, so what the resometer does that is top drawer is that it actually points to what the resolution of the press is in both the X and Y direction. I agree with you a good type eval is an excellent general tell tale but if you are paying the bucks for this stuff then you better know what you are getting. One way to think about this is if you were told your car can get say 30 mpg and then you end up getting 18, this is not a happy scenario. Well wake up and you will see that the industry generally lets the advertised specs get away with them similarly. Now this overall grading is more important than resolution since it is the acceptability of the image that gets you paid and makes the printing work. So the ability to predict and show this in a simple way is a breakthrough. Always good to chat with you Gordon and Dave. Dave and Gordon - For production ink jet, dpi is pretty much Drops per Inch. For moving carriage ink jet, dpi often means how many different positions they can fire ONE drop as they move across the paper - without mention of how fast they go or how often they can fire. For CURRENT web systems, dpi means how many drops they can fire on one inch of paper as it goes by and how many jets there are across an inch of web width. dpi is counting, not quality. The exception is HP which has a very complicated jet firing system that takes a whole chapter to explain. Let them (try to) explain it. In any case, ink jet dpi is only loosely connected to image quality or resolution as Henry said. Drop/spot size and aiming accuracy play a big part in delivered quality. At Paul. Yes, dpi is the addressability grid - i.e. The device can image x number of drops of ink per inch. It doesn't tell you how big of a mark the drop of ink will be - and it doesn't matter if the head or the media is moving. The mark is certainly not 1/1200 ths of an inch which is what "a resolution of 1200 dpi" implies. I'm sure that David's eyes are glazed over by now - however, again, I would hope that he rephrases his reporting so that it does not perpetuate misleading vendor terminology. From the beginning of my the first production inkjet series, and following on in this series, I have tried to inform the potential buyers and interested parties in a 'balanced' way of the issues surrounding production inkjet technology. I have not been "parroting" or "perpetuating misleading vendor terminology". My eyes are not glazed over, they are blinded by the cloud of marketing hype of some vendors. It's amazing how some of them can list DPI for some of their inkjet products and 'apparent screen ruling' for others. While not all, some vendors seem to have made a habit and art of obfuscation? And in some cases, even hire proxies to do their bidding. I am not paid by WhatTheyThink or any vendor to write this series, it is done as a way to help the readership make decisions during what is a very important industry and technology transition. For those readers who are interested in digging deeper, there are a number of primer articles, along with more detail about production inkjet, and the way each vendor has chosen to implement it, in the other articles in this series. Further more, service providers should be focusing on purchasing a device that would support their individual requirements, and in the end make sure that the quality of the final output of that choice also meets the demands of their client base. Offence seems to have been taken. None was intented.